The book thing is still going on. Okay? There are still books. I haven't run out yet. Click either cover to order through PayPal! And, as always, if you've contributed $15.00 or more through Patreon, just shoot me a message and request a book. Oh, the ghost lady mentioned earlier. I thought she just sat in one place staring out a window. Good to see her up and about! yet somehow Jack still doesn't have a girlfriend. Pretty sure Tomie IS his girlfriend. Mary McRockshard or Mary Shrieks? The first one. Sam's girlfriend. Who's the first Mary? 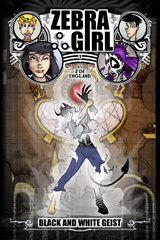 Can someone point me at a comic where she appears (not the chatroom ones)? We first see Mary at her brother's wedding with Sam. That's actually her only appearance to date, beyond that we've only seen pictures on Sam's phone. Gah! I really want to know what Tomie's transformation backstory is! Jack had been poring through Tomie all day. All week, really. He'd barely left his room, and Crystal couldn't quite bring herself to actually knock on his door, though her knuckles came closer and closer every time she passed. But Jack knew that if he was to come to any significant understanding of the world he'd flung himself and his friends into, he would need to practically memorize this book. His book. His Tomie. The hour grew later and later, to the point where it was just turning the corner and becoming earlier again, as Jack pushed his hair out of his bloodshot eyes and brought himself and his book from the desk to the bed. Conserve energy. Don't waste it on keeping upright, just worry about keeping eyes open, about reading the next passage. Chin propped on hands, Jack let the words on the page sink in to his face. His whole face. They entered his eyes, but did not continue on to his brain. They meandered a bit through his sinuses, flaring out to his cheeks, and dropping ever so slightly down his throat before a shallow breath would push them out of his mouth. The words never did reach his brain, but they did pull him closer, closer to the pages they came from. And shortly Jack's nose found itself nestled in the crook of a page. His eyes closed, cutting off the inflow of words, and his mouth only mumbled the few syllables remaining in his system before it closed as well. When Jack awoke, minutes later, hours later, days later, he couldn't be sure, it was to the rising and falling of the pages beneath him. A stray arcane letter fell from his lips as he righted himself and rubbed the back of his head. There was another body lying there with him. And, he realized, his nose had not been nestled in a book. At least that's *my* headcanon. Ha, wonderful! 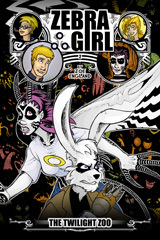 Thank you Fishamaphone, it's been ages since someone wrote any bit of fan fiction for Zebra Girl. Why, I'm tempted to not ever clarify Tomie's origins, now, because you've made speculation so appealing! It's probably a real page turner. Wait, Mary is Jack's doing? I mean, I was surprised to see her, but I'd assumed she'd just been translocated in the same magical disaster that brought Sam to their current universe. And she's dead, some kind of ghost? Wow, apparently more went on while Zandra was gone than I'd thought. Mary, Sam's girlfriend, submitted herself to a magical procedure to become a rabbit. The only ghost here is... well, we'll learn more about her next time. D'oh, I completely forgot that somehow. Now Jack's comment flows much better. For reference on Mary. Guess I'm a znerd. Wait, it's daytime? How come vampires can be out during the day? This version of vampirism allows them to be out and about during the day, they just can't be seen or interact with anything. Yeah Jack, we definitely believe that it's all an accident and you're not just a perv. Keep up the good work you weird beard. Hey Joe, just letting you know I just received Volume 2, Volume 1 should be here next week. Thanks! You're welcome, enjoy your books! Just a suggestion; the book covers are fairly nice(A bit busy, perhaps, but they get the point across), but it'd be cool if you had some 'formal' covers with simplistic art from your own modern era. For example, one themed around Sandra/Zandra; Black and White stripes on a grey field before her realization, and black, white, and purple after. Plaid for Jack. Dunno about the others. I really believe that your work is good enough to deserve that sort of pretentious artsy cover, suitable for hipsters to put on a bookshelf in their bathrooms. Ha, thanks. Maybe for a boxed set! Tomie, Mary, and Zandra... So those are the "Three Eves" of which Zandra was the first. And Mary with Sam will be heralds of a "new race" like Incubus predicted! Rereads make things so much clearer. ...My god. I never caught that.